Easyglaze’s French windows offer a distinctive style of window to shape the look of a home, combined with the practical function of being able to be used as a fire escape. Open any property to the surrounding environment providing totally unobstructed views with the assurance of swiftly exiting the building when required. Manufactured from our Liniar EnergyPlus profile offering slim sight lines to let in maximum light and available in a wide range of colour choices. As with our standard casement windows they are available in either a modern Sculptured or more traditional Chamfered profile and offer unrivalled thermal performance, easily achieving an A rated WER as standard. For peace of mind they are internally glazed and use Yale’s Shootbolt high security locking system as standard which is back by their Security Guarantee which offers up to £1000 towards to insurance excess in the unlikely event of a break in. When you choose our French windows you can forget worrying about draughts – Liniar’s exclusive double-action bubble gasket, used in all its glazed products, keeps your windows leak-free and weather proof by delivering a continuous seal – even in the corners. We also attached the flying mullion to the master sash which keeps the amount of plastic profile on show to a minimum. They also allow even smaller openings to be used as fully Building Regulations Part B. compliant fire escapes without the need to offsetting a opening sash and therefore spoiling aesthetics of a property. Optional “Easy-Clean” hinges for fast and hassle-free window cleaning and maintenance. 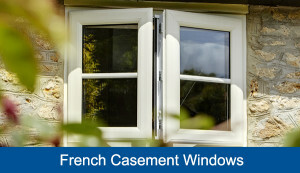 It is possible to open both vents fully or alternatively open the master sash independently to the slave for ventilation.